I made the mistake of trying to remove a Schlage lockset with a regular screw driver too many times. (The knob makes it impossible for an ordinary driver to seat properly on the Phillips screw head. So every time I touch it, the screw heads get worse.) Now I've stripped both screws. I installed the door knob in the main entry two years ago, and it gets a lot of use. I originally attached the screws with threadlock because I was so fed up with re-tightening them every few months. I was expecting them to be a bit stiff. But since I was the one who put the thing together, I thought I could just carefully back it out. It got it off once, but not any more. So I wised up (a bit) and bought a $3 offset screwdriver, but the screw heads are too worn. The offset driver just slips out of the heads no matter how tight I grip it, and I've cut both hands trying to hold it steady. I tried setting up a screw extractor, but the knob prevents me from drilling through the center of the screw. I also tried tapping the handle-end of a flat head screwdriver, with the flat head tip placed on the axis, to try and get some counterclockwise rotation, but the threadlock seems to prevent any movement. Unfortunately I may have to completely destroy the lockset to get the thing off, which seems like a complete waste, but I'm running out of ideas. Is there anything else I can do that might remove it, without losing any more blood? I'd drill the existing screw head off, use a bit slightly larger than the shaft of the screw but smaller than the hole in the knob. The stripped out screw should keep the bit fairly centered even when used at a slight angle. Once each head is removed you can pull the knob and try a screw extractor on what's left, but there's a good chance you'll need to replace the entire lockset at this point. What you should have done, and should start by doing, is check whether this lockset will let you remove the inner knob. Cheaper ones often won't, but more expensive ones will have the same kind of release as on the outer knob -- rotate the thumbturn to the unlocked position, depress the rectangular catch below the knob shaft's surface, and pull the knob off. If you can do this, you would/will have straight-line access to these bolts, which would/will make removing them a lot easier. If you have a high-speed rotary tool, you may be able to carefully cut a new slot into the bolt and use that to remove it. You're fairly likely to damage the rose adjacent to the bolt, but since that isn't an area people often look at this may be acceptable. Or you could try getting one of the reverse-threaded drill bits used for screw removal, and see if you can get one of those anchored well enough in the screw to use it to back the screw out. That works better if you can get the knob out of the way. I finally got the screws out, and as you can see by the picture The lockset is largely intact. The key was to prevent the offset screwdriver from slipping. As suggested, in one of the screws I had to cut an "X" and use a flat-head driver, but the other I was able to use as is. Ultimately I had to apply a lot of pressure to prevent the driver from torquing out, while at the same time bracing the driver to prevent it from toppling out. the offset screwdriver - a screw driver with tips at both ends and no handle. It is bent with two 90-degree angles in the shape of an "S"
I set the offset screwdriver with one end in the lockset's screw and the other end tucked into the drill guide. Then with the push-stick I leaned in with a lot of pressure. Now as soon as I apply pressure, the offset screwdriver wants to slip out of the drill guide. But by gripping them together with my hand, I was able to keep everything braced. This prevented the screwdriver from toppling no matter how hard I leaned in. Once I got a good grip, I leaned in and rotated everything together, keeping my eye on the screw head for any signs of slippage. The screw would creak, and I would get maybe 1/4 turn at a time. Eventually I was able to back out enough of the screw head to grab it with vice-grips. Took me a few hours, but I got it. I damaged the rose while I was deepening the groove with my rotary tool, so I just cut through the whole thing and removed it. Not sure if I will be able to replace it, but I can always swap this particular lockset with one that leads to the utility room. On the other hand, I could probably get away with just a bit of gold-colored spray-paint. 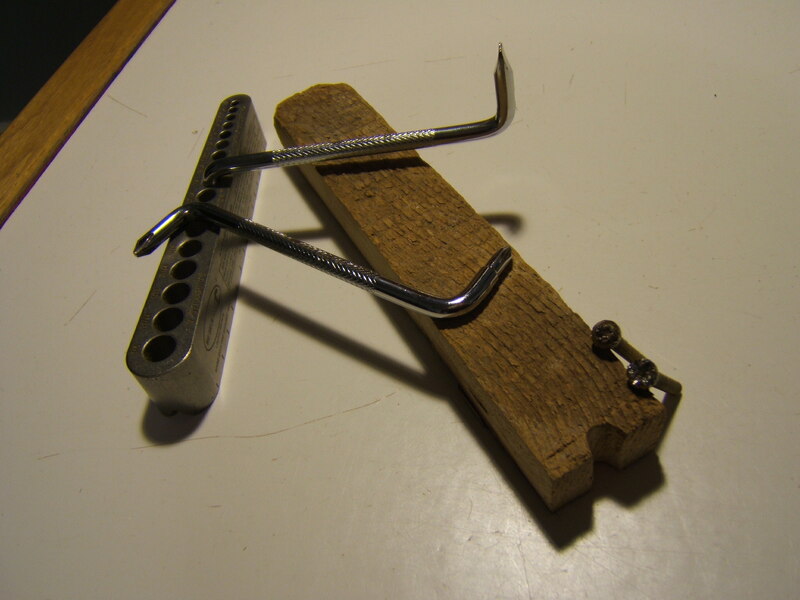 Use a reciprocating saw to remove the knob. Use it as a therapeutic session to vent your frustration. If you spend 6 hours and a couple of band-aids to save yourself from buying a new $25 door knob, you're behind a lot more than $25. (Time is money). At some point you just have to bite the bullet and purchase new things and trash the old things. Not every situation is salvageable. Not the answer you're looking for? Browse other questions tagged repair doors screws lock hardware or ask your own question. 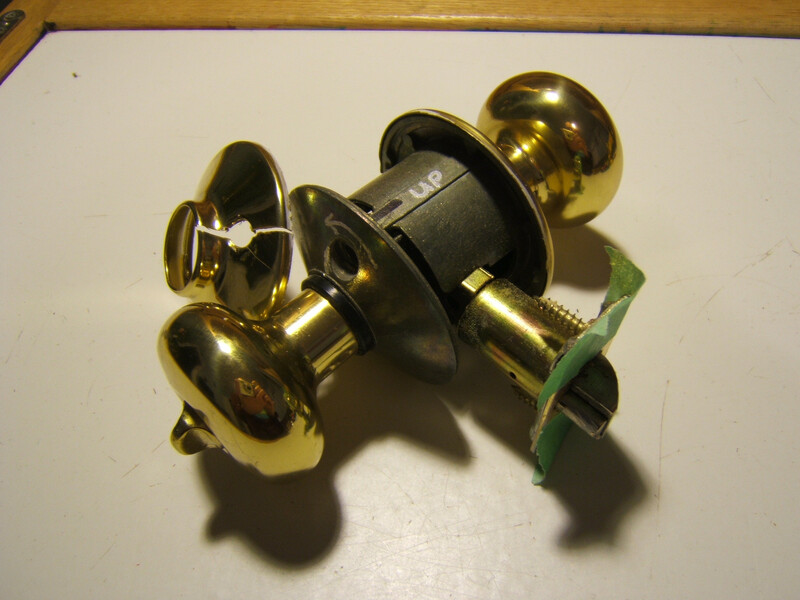 How to remove a doorknob with no visible screws? How to get threshold screws out? Help please!!! Screw won't loosen? How can I identify these small screws for my range hood lights?